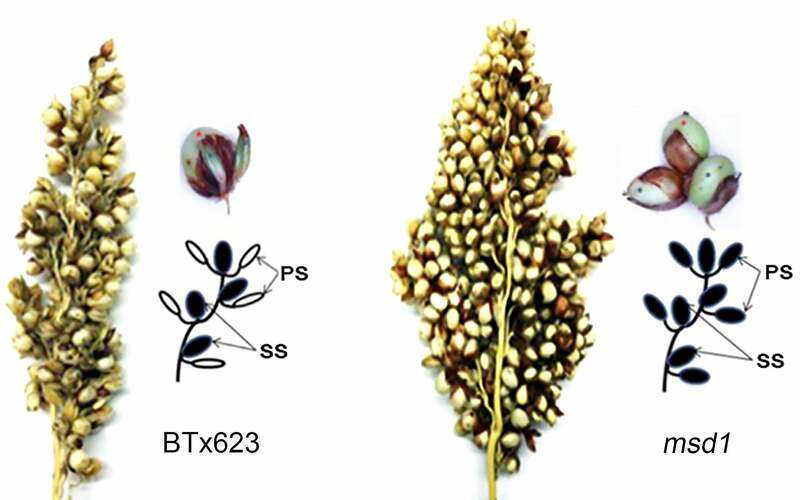 Sorghum’s grains are produced in clusters of flowers that develop from an elaborately branched structure at the top of the plant called a panicle. Each panicle can produce hundreds of flowers. There are two types of flowers. In the plant one finds in the wild (left), only one of these, the sessile spikelet (SS), is fertile. The other type, pedicellate spikelets (PS), do not make seeds. In a modified version of the plant (right) both sessile and pedicellate spikelets produce seeds, tripling each plant’s grain number. Scientists have figured out how to triple the number of grains that the sorghum plant produces: by lowering the level of a key hormone, generating more flowers and more seeds. This points toward a strategy for significantly increasing the yield of sorghum and other staple grain crops. Cold Spring Harbor, NY — A simple genetic modification can triple the grain number of sorghum, a drought-tolerant plant that is an important source of food, animal feed, and biofuel in many parts of the world. In new research reported today in Nature Communications, scientists at Cold Spring Harbor Laboratory (CSHL) have figured out how that genetic change boosts the plant’s yield: by lowering the level of a key hormone, generating more flowers and more seeds. Their discovery points toward a strategy for significantly increasing the yield of other grain crops. Evidence of the team’s success: the left image shows a “terminal spike” with several sessile spikelets (round) which contain seeds, and several pedicillate spikelets (white arrows), narrow oblong compartments which don’t “fill” with seeds and don’t form grains. In a genetic variant (right) all the spikelets are sessile and contain grains. Doreen Ware, Ph.D., a CSHL Adjunct Associate Professor and research scientist with USDA’s Agricultural Research Service (ARS), led the research, together with ARS colleague Zhanguo Xin, Ph.D. Their study was focused on high-yield strains of sorghum that were generated several years ago by Dr. Xin. An unknown genetic mutation introduced by chemical mutagenesis—a method used for many decades by breeders and researchers to induce genetic variations in plants—resulted in an increase in the number of grains, i.e., seeds contained within fruits, that each plant produced. Like many cereal crops, sorghum’s grains are produced in clusters of flowers that develop from an elaborately branched structure at the top of the plant called a panicle. Each panicle can produce hundreds of flowers. There are two types of flowers, and usually only one of these, known as the sessile spikelet (SS), is fertile. The other flower type, called pedicellate spikelets (PS), do not make seeds. In the modified plants Dr. Xin produced, however, both sessile and pedicellate spikelets produced seeds, tripling each plant’s grain number. Through subsequent experiments, the team learned that jasmonic acid prevents pedicellate spikelets from producing seeds. “So when the plant hormone is low, we get seeds set on every single one of the flowers. But when the plant hormone is high, we have a reduced number of fertile flowers, ending up in a reduced number of seeds,” explains Dr. Yinping Jiao of the Ware lab, co-first author on the new paper. Now that the team has uncovered the biological changes that triple sorghum’s grain production, they hope to apply the same strategy to increase grain production in related plants that are vital in the global food supply, such as rice, corn, and wheat. 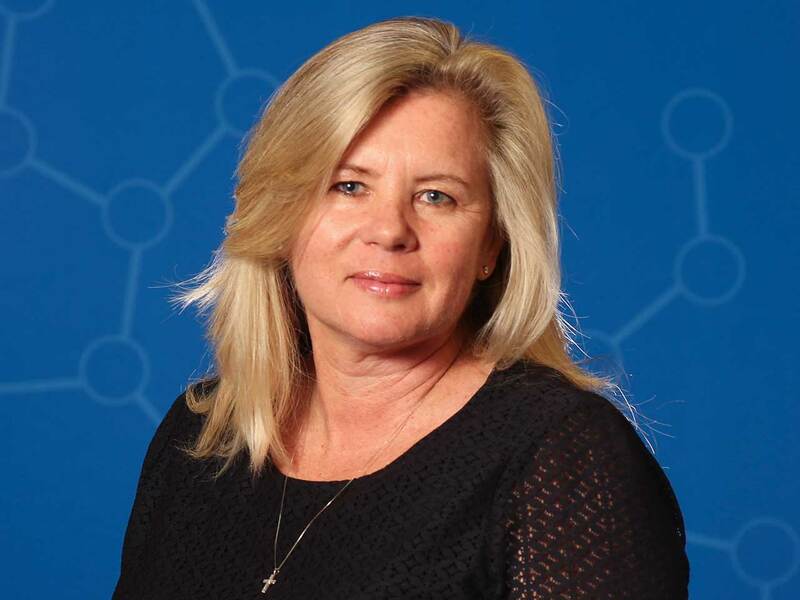 The knowledge will help guide crop improvement through traditional breeding practices as well as approaches that take advantage of genome editing technologies, Ware says. Jiao Y et al, “MSD1 regulates pedicellate spikelet fertility in sorghum through the jasmonic acid pathway,” appears in Nature Communications on February 26, 2018.